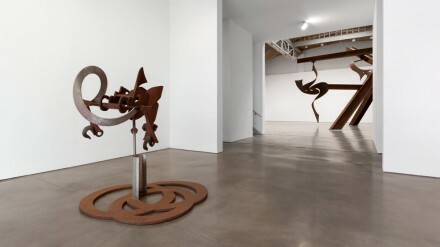 » New York – Mark di Suvero: “Little Dancer” at Paula Cooper Gallery Through July 3, 2013. 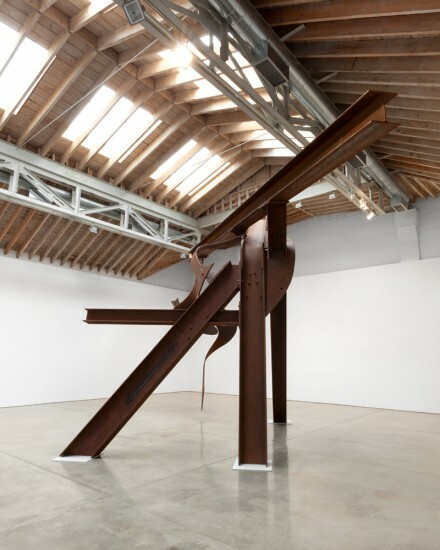 - AO Art Observed™ New York – Mark di Suvero: “Little Dancer” at Paula Cooper Gallery Through July 3, 2013. 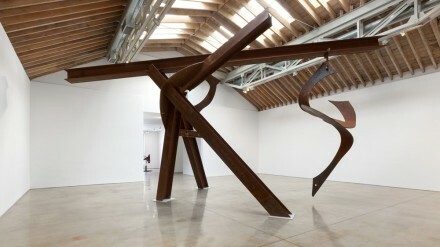 Home » New York – Mark di Suvero: “Little Dancer” at Paula Cooper Gallery Through July 3, 2013. 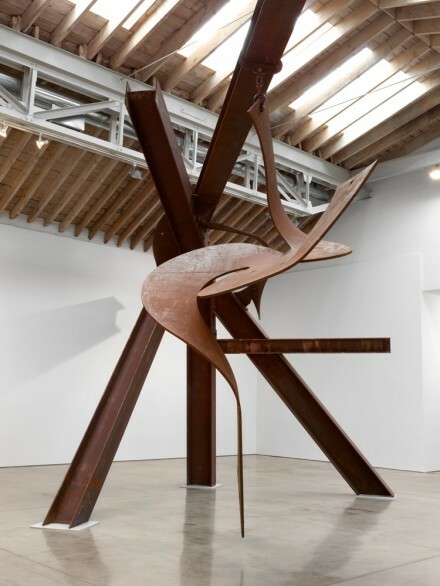 Mark di Suvero is an American abstract expressionist sculptor that often works in kinetics, incorporating dynamic movements to add an element of illusive grace to his monumental sculptures. Continuing his exhibition partnership with Paula Cooper Gallery in New York, the artist is currently exhibiting a new sculpture, Little Dancer, as well as a number of other works in both sculpture and canvas. 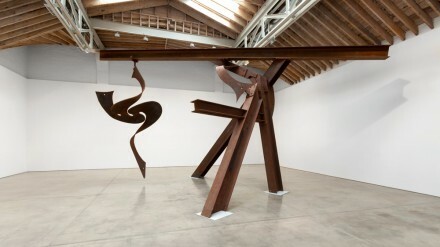 Mark di Suvero, Little Dancer (Installation View), via Paula Cooper GalleryDi Suvero’s work is multifaceted. His large scale steel constructions, which often seem to defy gravity, evoke a philosophical contemplation of physics informed by his early experience in construction. After graduating from University of California with a B.A. in philosophy, he moved to New York and began to focus on his art-making, creating from wooden timber pulled demolition buildings, tires, scrap metal and structural steel. After a work-related injury at a construction site, the artist was told he would never walk again, and defied all odds, quickly recovering. Interestingly enough di Suvero did not let the incidence deter him from working with heavy machinery; and would go on to push the boundaries of sculpture by being the first artists to work with a crane. Di Suvero currently resides in New York, but often works in Petaluma California where he has had an open air studio space since 1975. Di Suvero’s work can be found in many major museums and public collections, such as the Hirshhorn Museum and Sculpture Garden, Metropolitan Museum of Art, the Museum of Modern Art, National Gallery of Art, the Whitney Museum of American Art, the Walker Art Center, and Storm King Art Center where he has had three major exhibitions. Di Suvero has also spent much of his life actively promoting the practice of other artists, an ongoing part of his work since he founded the gallery space Park Place in 1963, the first gallery that was a wholly artist-run cooperative. 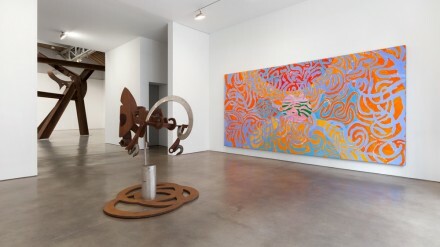 These types of ad hoc galleries and artist spaces quickly became a staple of the growing downtown contemporary art scene of New York, placing Di Suvero at the center of the budding art world. The artist is also the founder of the Athena Foundation, and established the non-profit arts organization Socrates Sculpture Park, located near his studio in Long Island City. His efforts were officially recognized in 2005, when he was selected as the recipient of the 11th annual Heinz Award in the Arts and Humanities. He has also received praise from the International Sculpture Center, which awarded him the presitigiuos Lifetime Achievement in Contemporary Sculpture Award in 2005. This mission to benefit the efforts of his fellow artists is again echoed here, as proceeds from the sale works will go to benefit the construction of the new Whitney Museum in Chelsea. The artist’s combination of highly skilled craftsmanship and ideological thought is apparent in the sculptures exhibited at Paula Cooper. The steel structures are whimsical in their bending forms and curves, yet rendered with a stoic, hardened texture that keeps them from moving into pure fantasy. His titular work, Little Dancer, perfectly capitalizes on this approach, an assemblage of intersecting l-beams and carved kinetic spirals. Chained up to the main body of the work with thickly wrought chains, these curved spirals float effortlessly, exuding a sensitive weightlessness that contrasts with the dull ochre and heft of its suspension system. In other works, di Suvero pulls influence directly from mechanic forms, particularly in one smaller work, which bears a resemblance to an engine block or other device. Looping long strands of steel through the work, the artist invites a consideration of the dichotomies between industrial materials and their uses, showcasing the artist’s role of transforming heavy materials into beautiful, balanced forms. Little Dancer closes on July 3rd, an excellent opportunity to see work by a prominent American sculptor. This entry was posted on Wednesday, July 3rd, 2013 at 11:13 am	and is filed under Art News. You can follow any responses to this entry through the RSS 2.0 feed. You can leave a response, or trackback from your own site.